In the morning we agreed that driving straight through to RI was the best bet, save as much time as possible on this trip that we were starting to reconsider. 17 hours later we drove into our old driveway and wondered what the hell we were doing there. We were tired and emotions were running. The house was abandoned 5 months ago, with only our friends in and out to pillage the stuff earmarked for them. It was sad to see Tom’s house like that, the house he had spent years bringing back to its original glory. We sat in the backyard after doing a complete sweep. I don’t want to be here. It was all so surreal. The sounds of the neighborhood reminding me why I left in the first place. I tried to take a nap but I couldn’t sleep on the dirty, dusty couch. The couch that was before my safe spot, it would cradle me when I was sad or anxious and now it had turned on me, it was like we never knew each other. I was done. At this point all I wanted to do was what I was here to do, see my sister! By now it was 8 or 9 in the morning which was pretty early for a Sunday wakeup call but I couldn’t sit here anymore and I couldn’t wait to see her face! To sit on her couch with her and do what we do best was the perfect remedy for all the weird emotions I was feeling. I was able to make it for about 4 hours when exhaustion finally got the best of me. I drove back to the house and found Tom still in the backyard, drunk and playing guitar. I strung up a hammock and fell fast asleep. Around 2:00 I was awoken by the relentless beating of the sun, and though not yet through sleeping, I knew no more would be had in this hammock. I woke Tom up and we crawled into my sister’s apartment and slept until she returned at 5. I can’t explain to you the feeling of home, I could but you wouldn’t feel it as I do. The words I use to describe places you’ve never been (and if you have, you certainly don’t have the same attachments as I) will never be enough to express the feeling; but I know you know the feeling of home, I know you too couldn’t make me understand in your words and experiences your own feelings of home. But we did all the things we’ve always done together, reminding me that this is, and always will be, my home. It was so appropriate that we were in RI on V.J. Day as this is the only state in the Union where you’ll find the 2nd Monday of August is a recognized holiday, just another thing I could only find at home. We took full advantage of Tami’s day off from work doing all the things we would normally do together before going out to Newport and picking sea glass until there was no more to find. After four days it was time to go. As anxious as I was to get back on the road it was so hard to leave my sister, again. However as nice as it felt to be back with her, it was weird to be back in RI, almost like we hadn’t left yet. 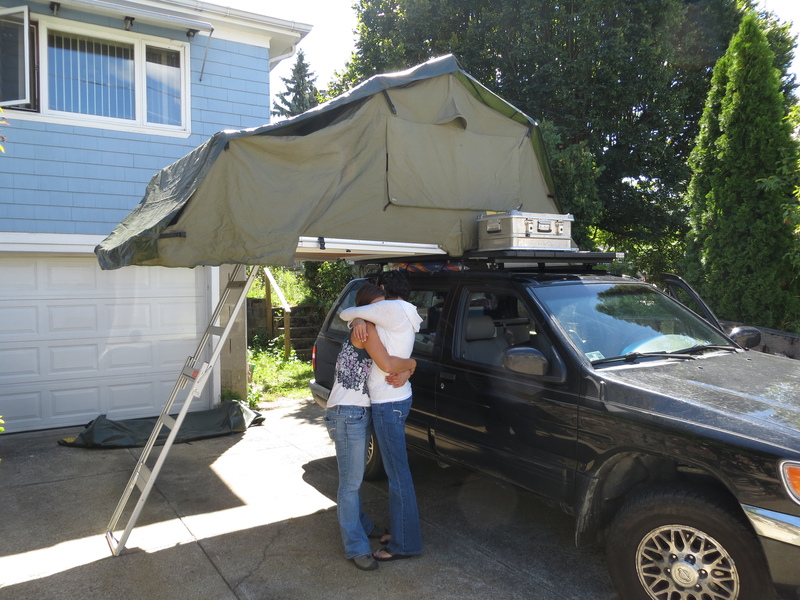 Somehow, after a million tear-filled hugs, we finally pealed ourselves apart, said our goodbyes and I drove away. I had hoped to visit my favorite beach spot while we were in town but we packed our time so full that we didn’t make it. In the 15 minute drive to the beach exit I hemmed and hawed about it, trying to decide if we should go now. Normally I would plan the trip around low tide as there is no beach at high tide. It was cold, and getting late in the morning, I was anxious to get back West, past PA at least, before I would feel okay with having taken this detour. Finally I decided that we should go, we were all the way out here, what was another hour or so?? 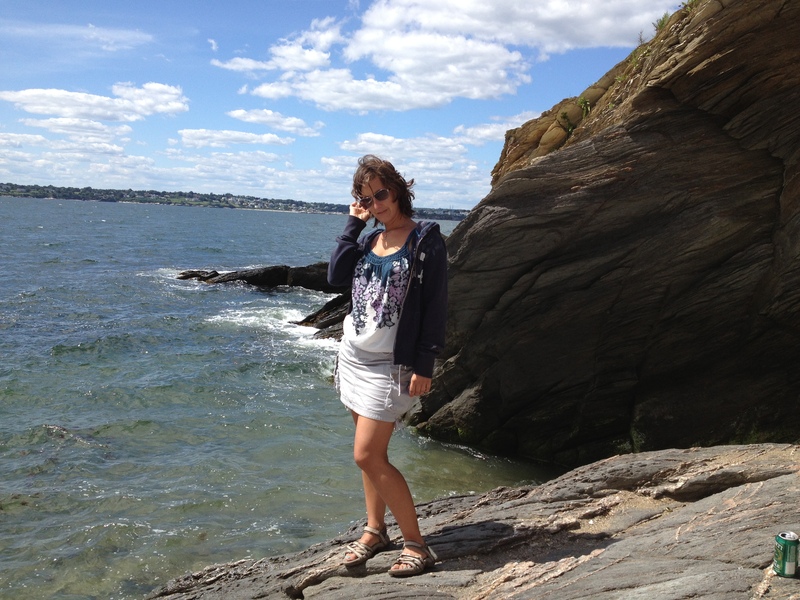 It was cold and high tide but I’m glad we made the trip anyway. Home is nice… but I’m ready to leave again! We left SoNo after dark but we wanted to at least get over the Tappan-Zee Bridge before stopping, and we just about made it before I had a total meltdown of carsickness. Quickly Tom pulled into the 1st motel he saw and I went straight to bed. Luckily I felt fine in the morning because we were on the road again. We got into Pittsburgh pretty early and had fun walking around campus and Tom’s old stomping grounds. I loved the tour and listening to him reminisce of his days there. We had lunch at The “O” complete with fries and gravy (I thought that was an old Jericho’s thing!) before heading out to find camp. 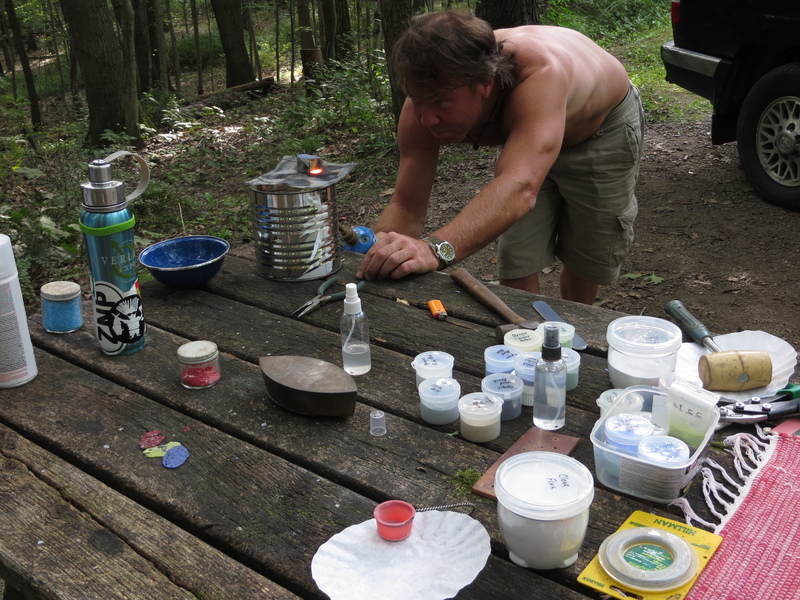 We got a nice, private, wooded spot at Raccoon Creek State Park in Hookstown, PA and started in on some enameling. This time things were working a little bit better and I made a pretty nice looking heart. 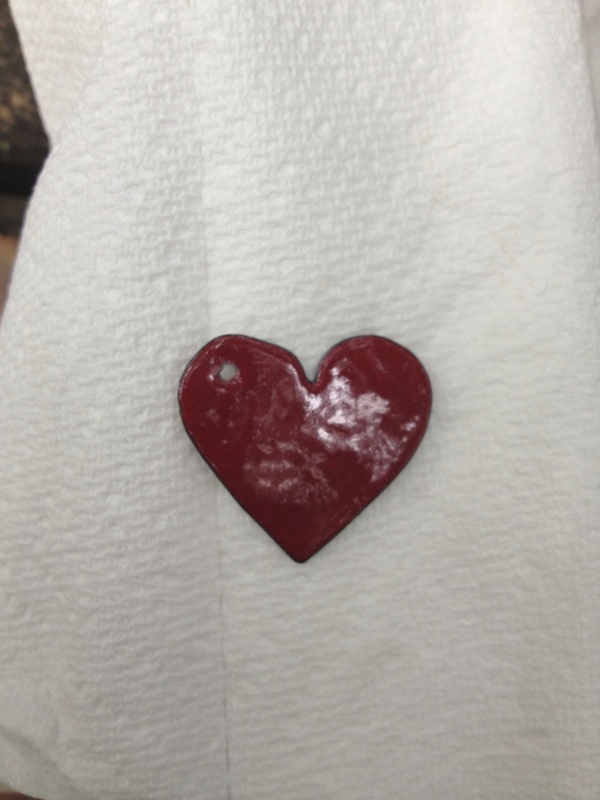 Tom worked on a guitar pick that he then made into a necklace, there may be hope for us yet! We thought a trip to a flea market was in order so we could find some more tools and copper; but after perusing the huge affair we left with only a couple of chains and two cups that turned out to be copper-plated. The next day was rainy and cold and after driving some hours I was in a real bad state. I missed having a couch and a TV and I just wanted to lay down and relax but felt trapped inside the truck (with all it’s responsibilities of navigation). I sat for as long as I could take but then broke down and admitted to wanting a hotel for the night. I really hate that I have these moments. But dressed in my sweats I sat on the bed happily interneting and texting with the TV on in the background. I took a long, hot shower and relished in my cleanliness; this was just what I needed. Completely refreshed in the morning we drove out to Thompson Enameling to tour the gallery and factory. Tom Ellis showed us around and answered our million questions regarding technique and supplies. He showed us how the glass was made and crushed into the powder enamel. After 2 hours we closed the place down and made plans to come back tomorrow to do some ordering. We found Winton Woods Campground and got a nice spot on the water, Tom had good luck with the internet but I didn’t so I got to cooking dinner. I made some pasta sauce with the vegetables I had left from my sister’s mom’s garden. So sad to use the rest of these links to home! I wrote a bunch for the blog and then we climbed up and watched Colbert before falling asleep. In the morning we explored the Thompson Enameling catalog over coffee, there’s so much good stuff we want! Finally after making our wish-list we went back to meet with Tom Ellis. He spent some time showing us a few of tricks of the trade and it was good to have another perspective on the technique of enameling. Then we made our big order – gulp! After the 3 hours we spent there and the hour ride back to camp we were ready for bed! Now that we’ve visited Thompson we felt the urgency to get the heck out of the midwest once and for all! We drove as far as we could before getting pulled over in IL for speeding. Luckily the cop felt bad for us and let us go with a warning. Our defense? – That was the most boringest drive ever! We made it to Hunnewell, MO and found free camp at Hunnewell Lake Conservatory. We took the only spot with a tree and set up for a couple of days. I did yoga and took a camp shower. Over dinner a stray Siamese cat started getting friendly with us. By the next day she was all mine! But of course, Tom wouldn’t let me keep her! 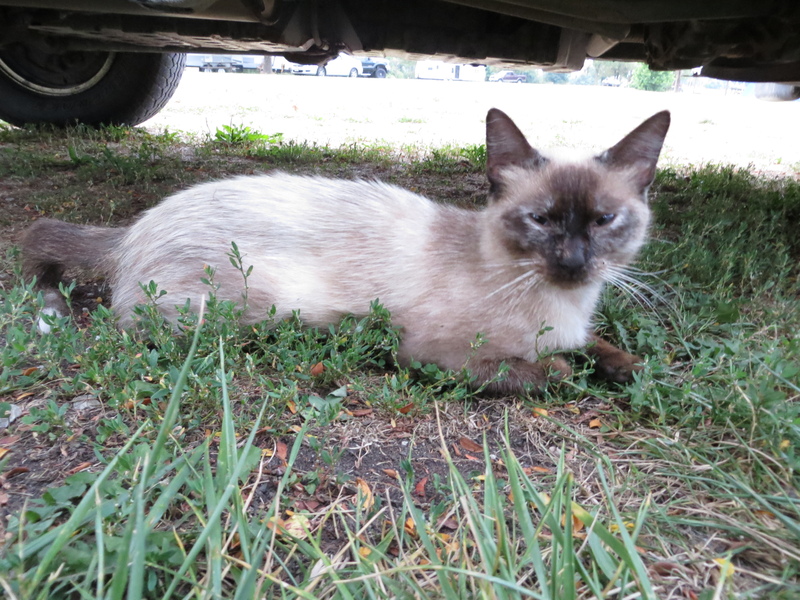 (even though I found out her name was Jungle Kitty which has been my sister’s nickname for over a decade!) 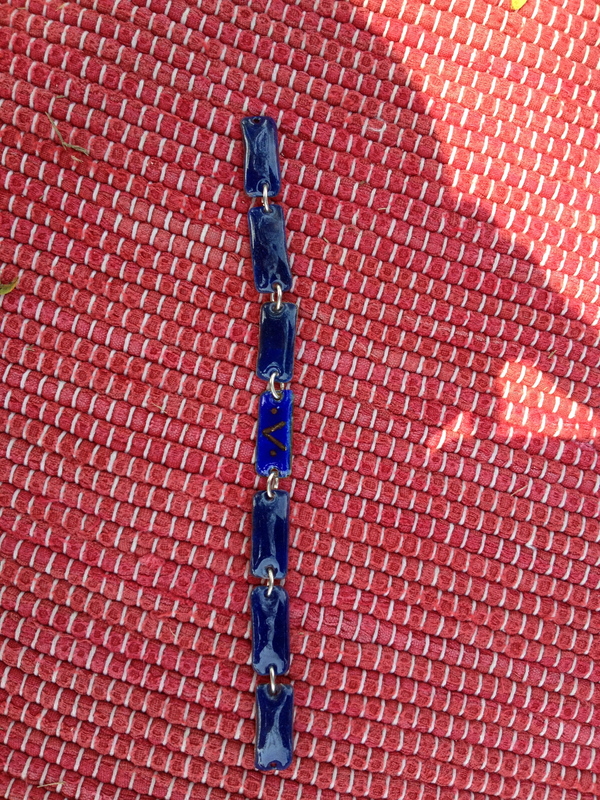 We spent the day playing with our new enameling supplies; I made a bracelet but wasn’t too pleased with the outcome. More yoga and camp showers and we thought we should stay another day, it is free after all! But some people moved in on our privacy so we took off. Buzz Buzz! 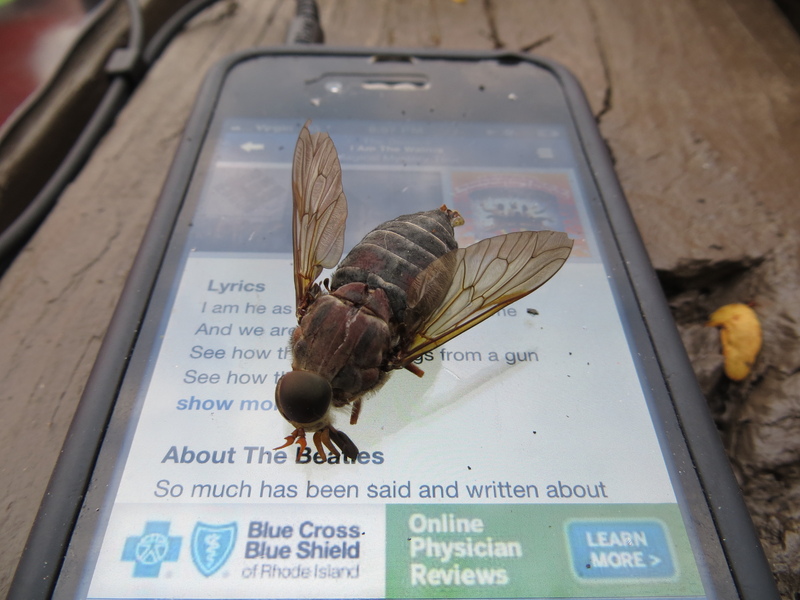 This horsefly was loving my yoga sessions. I was seriously not happy with him. We found a lake with a cool pebbly ‘beach’ so we sat down and picked up rocks for an hour or so. 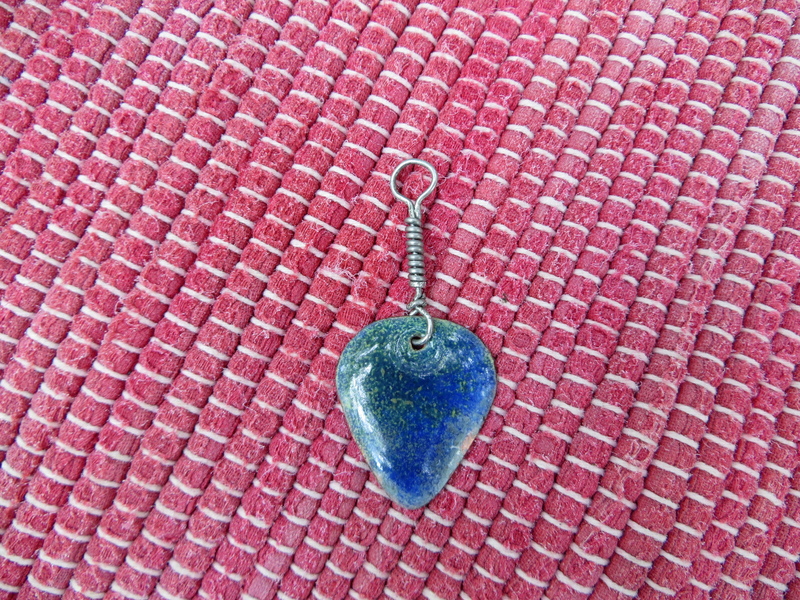 When our pockets were heavy (we’re going to see if we can use them in enameling somehow!) we found camp at Frank Russell Campground in Monroe City. It was just the private Mecca we were hoping for. I made a pretty good rendition of Micha’s kielbasa and rice and we hit the sack early; so early that we were both awake at 6 am ready to go. We planned to drive as far as we could and get out of Misery!